Those of you who follow me on facebook may have seen that I was feeling very pleased with myself for having resisted the (very strong) urge to buy fabric the other day. Rascal loved her Christmas twirly dress so much that I decided to make her another one. The only thing was that I needed 75cm of fabric for it and the biggest suitable pieces in my stash were 50cm. I had the fabric that I wanted to buy all chosen and was on the verge of splurging when something stopped me. 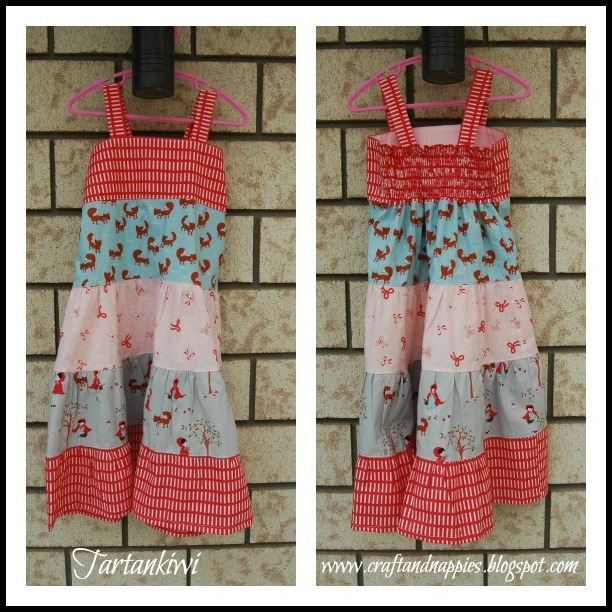 I thought and thought and finally decided that I must be able to make a 4 year old dress using fabrics from my stash. I would just have to be a bit inventive about how I did it. 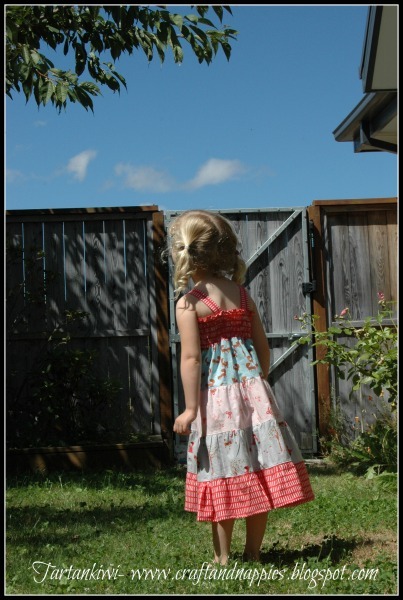 The bodice was made using the "In the Garden Shirred" Twirly Dress tutorial. The skirt was made using this basic tiered skirt as a rough guide, I added an extra tier and altered the height of the strips to suit my purpose. The fabrics are all from Aneela Hoey's "A Walk in the Woods" line. I bought them a while ago at a bargain basement price, without a project in mind. I think they make a perfect dress don't you?! I love the way that the red bands at the top and bottom bring the whole thing together. Now two of us are happy. I can be proud of myself for using fabrics from my stash. Rascal is over the moon with her new twirly dress! what a little doll- that is really a dress to be proud of- you are a super mom! It's adorable!!!! I love the shirred bodice! I love this dress, it reminds me of a similar dress my Mum made for me when I was a tike!! Gorgeous work! 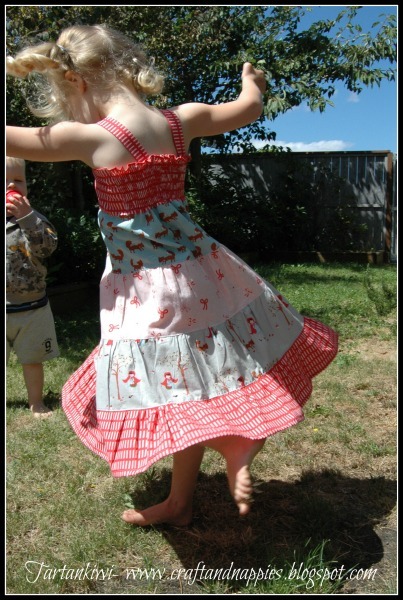 Well done on combining the two patterns to create a beautiful dress with the all important twirl factor!! !